We’ve talked before about how to keep your home smelling nice during the holiday season, but what about year round? And should you be worried about indoor air pollution from toxic home fragrances? By the way, the post was created in partnership with Plant Therapy. All opinions are my own. I admit it, when I walk into a home goods store, something about the fragrance that fills the air makes me want to buy all the pretty things. And while I’m there, I sometimes wonder how I can give my own home that same luxurious feeling. But there’s an underlying problem when I enjoy this experience- the indoor air pollution that those toxic fragrances contribute to. 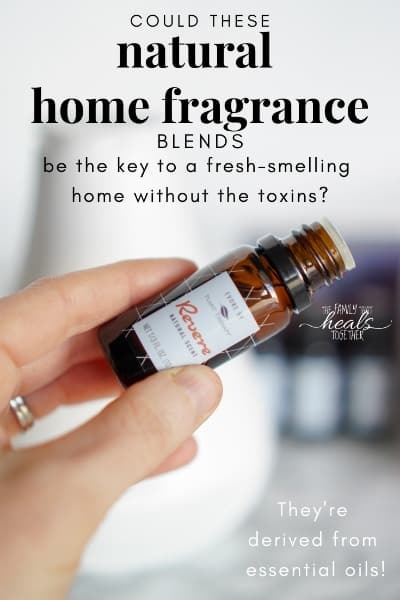 Are you wondering how in the world you can have a nice smelling home without toxic chemicals? Read on- I have a solution for you! Is indoor air pollution a problem in your home? Early in my healthy living journey, I learned a dirty little secret. All those products that are meant to make our homes smell nice? They are actually contributing to a big, stinky problem: indoor air pollution. “But Jaclyn,” you might be thinking, “isn’t outdoor air pollution a much bigger concern?” You might be surprised to learn the answer is probably no. Is indoor air more polluted? While we should be concerned about outdoor air quality thanks to modern industries, transportation, and even natural dust and pollen, it’s actually our indoor air quality that should alarm us. Outdoors, air is always moving and fresh air can be found. However, inside the home and other buildings, air remains largely stagnant and often re-circulates. Buildings tend to be closed up, with windows and doors usually staying fairly sealed up. Basically, buildings don’t breathe, therefore, the air inside can become quite toxic to breathe in, depending on what might be circulating. Let’s look at some of the major sources of indoor air pollution. What are some examples of indoor air pollution? Indoor air pollution can come from a number of sources. We should be mindful of the products we use, and even building materials and furniture we use in our homes. & yep, you guessed it, toxic fragrances found in home products. One study found that “scented consumer products emitted more than 100 volatile organic compounds (VOCs), including some that are classified as toxic or hazardous by federal laws.” These VOCs should be cause for concern because they can lead to a number of health complaints. I keep my office space toxin-free and fragranced with uplifting scents! What are the effects of indoor air pollution? Short-term, toxic fragrances in the home can lead to lung and eye irritation. Long-term, the consequences are much more serious. How do you get rid of indoor air pollution? To start, eliminate sources of indoor air pollution where you’re able. Address water leaks immediately, use a good air purifier, and make your own cleaning supplies with essential oils. You’ll also want to eliminate all sources of toxic fragrances from your home, which includes candles, plug-ins, potpourri, wax melts, sprays, and more. I know, this is a big step, and we all want our homes to smell good. I get it. Our home needs to be a welcoming place. We want it to smell nice and fresh, especially when preparing for guests. Thankfully, there’s an oil for that. 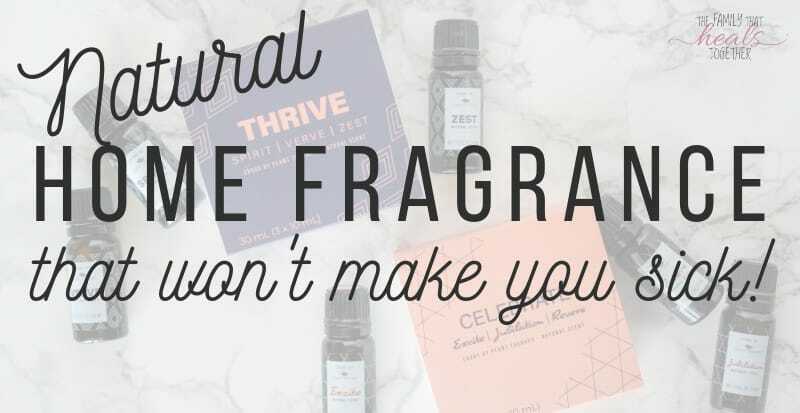 Actually, a whole line of essential oil-derived home fragrances that will make your home smell amazing without contributing to indoor air pollution. Evoke is a new line of natural fragrance products, characterized by their complex, emotive scents, derived from the natural aromatic components of essential oils. 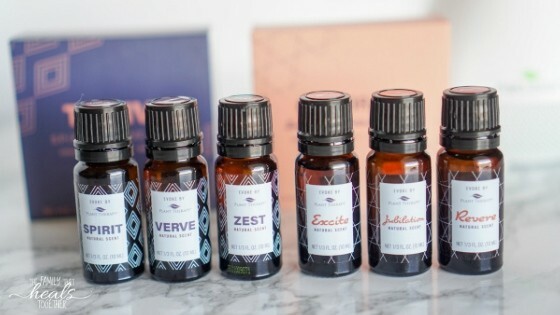 The super cool thing about these fragrance oils is that, while I absolutely love diffusing essential oils, these new fragrances bring a new level of depth to the various scents. 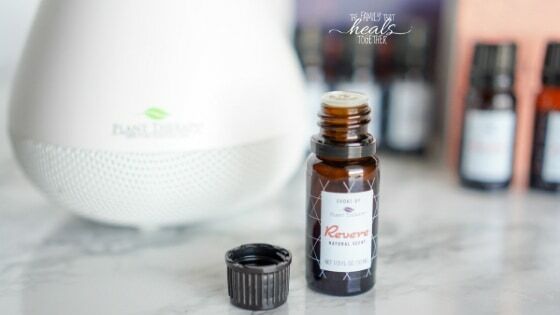 For instance, my favorite Evoke scent, Revere, is described as “floral yet spicy, with notes of apple blossoms and citrus, along with rose absolute, dewy greens, and soft musks.” Plant Therapy achieves this layered effect by using essential oil isolates. Fractional distillation, as described by Plant Therapy, is a method that involves the separation of a liquid into fractions differing in boiling points. As the material is heated, the vapor rises into a long column above the still. The vapor is repeatedly condensed and re-evaporated as it moves toward the top, which distills the vapor many times. The less volatile substances in the vapor tend to run back down the column after they condense, concentrating near the bottom. The more volatile ones often re-evaporate and move upward, concentrating near the top. Because of this, the column can be tapped at various levels to draw off different fractions. How are isolates used in Plant Therapy’s natural home fragrances? By using these isolates, along with pure essential oils, Plant Therapy has been able to create a totally unique natural fragrance line, filled with a variety of aromas. Using different constituents from different oils and combining them in creative ways, Evoke is a truly original fragrance line that smells amazing. Even better, because these fragrances carry over some of the therapeutic properties of the essential oils they’re made from, you may experience other benefits as well! So how do you choose which fragrance will best fit your preference? Well, I have my favorite, but I’ll let you decide! There are two sets of Evoke natural fragrances: Thrive and Celebrate. Each box contains three oils (which can be purchased separately as well), in similar fragrance families. In Thrive, you’ll find more masculine blends including Spirit (a woodsy, warm fragrance with notes of bourbon, vanilla, clove, and lemon), Verve (a more earthy, smoky scent with hints of lemon and cardamom), and Zest (a fresh and spicy scent with floral and citrus notes, as well as a bit of musk). In Celebrate, you’ll find a softer, more feminine set of fragrances, including Excite (a fresh, woody fragrance with hints of citrus and rose), Jubiliation (a soft, sweet combination of berries, rose, and musk, with a hint of baby powder), and Revere (my personal favorite, with its strong and fresh rose and citrus notes, along with a soft musk). You can purchase each oil individually for $14.95, or you can get them in sets of three for $39.95 (and they come in an adorable little gift box). Check out all of the fragrances from the new Evoke line here. By the way, Plant Therapy always offers fast, free shipping! The uses are endless, as Evoke fragrances can pretty much be used in similar ways to the essential oils they’re derived from. Diffuse them. I suggest this beautiful, high quality diffuser. Dilute them in a carrier oil in a roller bottle and apply them as perfume or cologne (you better believe I’m whipping up a bottle of Spirit cologne for Mr. Incredible and that Revere fragrance for myself!). Apply them to diffuser jewelry as another option to wear them and use them as aromatherapy on the go. Create a bathroom spray by combining them with a little vegetable glycerine and water to spritz in the water before you go. Use them in homemade cleaning supplies. Check out this guide. Create a home fragrance spray to spritz on linens (especially nice in the guest room!) or into individual rooms when the mood strikes (hello pre-teen boy room!). Add 20-40 drops of the Evoke fragrance of your choice, along with 2 tbsp of witch hazel and 6 tbsp of water to a spray bottle and spray to your heart’s content. By cutting out unnatural fragrances found in conventional candles, wax melts, and plug-ins, you’ll be avoiding one major source of indoor air pollution in most homes today. But- you can have your cake and eat it too, because avoiding harmful toxins doesn’t have to mean a stinky home! 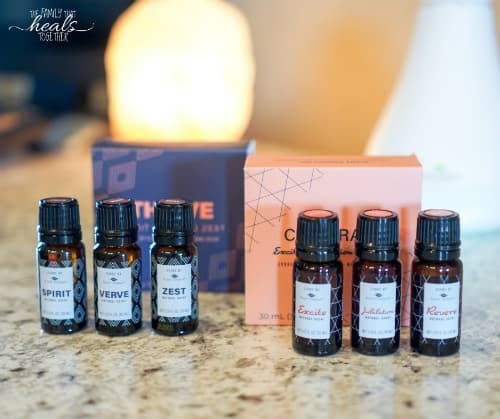 I have loved diffusing the new Evoke natural scents from Plant Therapy because my home has never smelled better, but I don’t have to worry about my family breathing in toxic chemicals. I call that a win-win.